When you owe a debt, the creditor naturally has the right to collect on it. What they cannot do is use whatever measures they like to get you to pay them. On the contrary, they must operate within a lengthy set of rules that are laid out in the Fair Debt Collection Practices Act (FDCPA). Get to know your rights with this summary of FDCPA violations. This information will not only help you spot debt collector violations, but will also inform how you deal with debts during the credit repair process. If a debt collector doesn’t know where you are, they are permitted to contact third parties to try and determine your location. They can then use this information to contact you about your debt. However, there are limitations to what a debt collector is permitted (and required) to say to a third party. If you owe a debt, you should expect the original creditor or debt collector (that has the right to collect on said debt) to contact you about it. However, there are limitations to what they can do. Note, the FDCPA states that “For the purpose of this section, the term ‘consumer’ includes the consumer’s spouse, parent (if the consumer is a minor), guardian, executor, or administrator.” (Rather than use the term consumer in this summary, we have used “you” instead.) In other words, your spouse is not considered a third party (unless you live in a state where spousal permission is required). 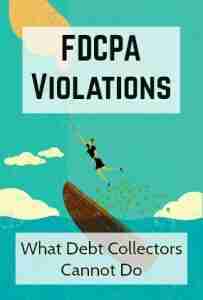 Debt collectors are in violation of FDCPA if they send you forms suggesting that another entity is involved in the collection process when, in fact, they are not. It takes more than a debt collector simply saying that you owe them money for it to be legally binding. That’s where debt validation comes into play, which can prove an invaluable tool when you are trying to repair your credit. If the validity of a debt cannot be proven, then you are not liable for it and it must be removed from your credit reports. Fortunately, there are strict guidelines governing this process that debt collectors must follow. Note, some or all of this information could be included in an initial written communication, in which case you should not expect to receive an additional notice within 5 days of the initial contact. Note, even if you do not dispute a debt, by law it is not considered an admission of liability. If you refuse to pay a debt that you owe, the debt collector has the right to take legal action against you. But as with every other debt collection practice, there are rules in place that protect you. The Federal Trade Commission recommends you file a complaint with them (the FTC), your state Attorney General’s office, and the Consumer Financial Protection Bureau (CFPB). If a debt collector violates your rights, you have the right to sue them (here’s how). Just because a debt collector commits FDCPA violations, that doesn’t automatically void your responsibility for the debt. If the debt is valid, you are still liable for it. That said, there is always room for negotiation. Learn how to settle debts with collection agencies.